The best thing about Soul Bakery is that all of the ingredients are simple and straight forward. Soya is not a staple (like in SO MANY bread products!) and I like nothing more than to be able to pick up a product and read everything on the label in less than 20 seconds and to know what every ingredient is without having to wonder and ponder its food allergy safety (i.e. Spelt Bread: Spelt Flour, Salt, Filtered Water). Oh yes, and the other great thing about the Soul Bakery is that the products taste good – always important!! This is a dense loaf which is generously filled with sultanas and apricots. Despite it being preservative free it lasts longer than you would think for a fresh loaf and is a great sweet treat. I actually can’t believe that the Apricot Delight loaf has no added sugar because it really is quite sweet and I think that it would taste amazing with tea or coffee! This log looks scrumptious. Again it has a generous amount of icing and walnuts which is so important, to me at least, and especially important for the price. 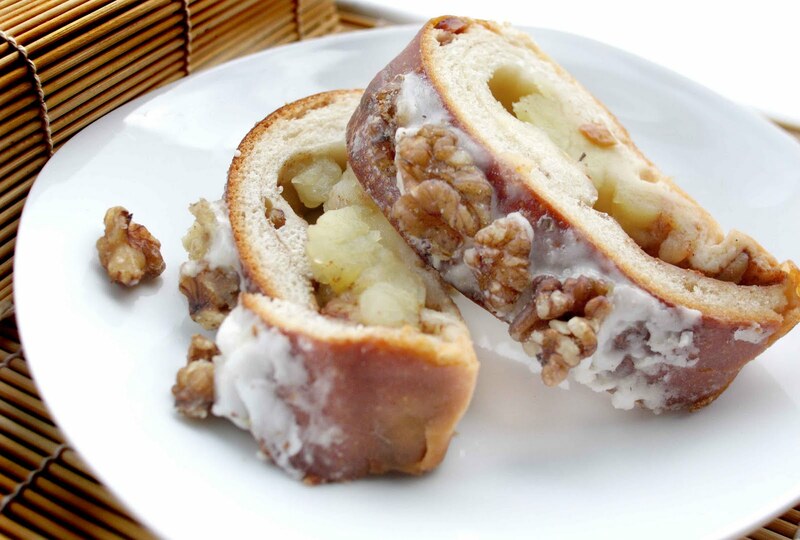 Soul Bakery describe the Apple & Walnut log as “One of our sweet treats…like strudel only yummier”. And it is similar to a strudel only larger (Pictured above). I haven’t tried this bread myself, but if you are spelt advocate then this is probably the one for you. The special thing about this dairy free loaf is that it uses spelt, which as you probably know, is an ancient form of wheat and to compliment this the loaf is actually made in a fashion that was popular 100 years ago. This one is a bit of a mystery with a secret ingredient and all! But it is completely yeast free and one of Soul Bakery’s most popular breads, or so they say.. I think that maybe their website is still in the process of creation because it’s a bit confused and unclear but there is a brilliant calendar of what markets they will be appearing in and when, which is enormously helpful. Regarding the ‘Our Breads’ section there are only a couple of breads listed and the information is a bit sporadic. Hi, Lovely post thanks. Would it be fair to say if their spelt bread is left for 24 hours to ferment that natural yeast in he air would be proving it? I love their Spelt bread, a fantastic product that no-one is making ! It has made such a difference to my diet. Previously I could not eat sandwiches with gluten bread without swelling up like a ballon and being in pain. (By the way I am test negative for celiac, however like many other people I am intolerant to gluten. ) Now I can eat sandwiches in a lovely bread and live a normal life again ! Yahoo ! I think Soul should be congratulated on a great product. I hope they keep making it ! It also makes fantastic toast ! !